Cereal, Pop Tarts, and Slim Fast are only a couple of the breakfast meals I have had over the past week and a half. I don’t remember the last time I made a decent breakfast. You know what I’m talking about. The kind of breakfast you would see on the kitchen table if you walked into Grandma’s house (pardon me while I wipe the drool from my mouth as I imagine that sight..). I really didn’t have a plan in mind for dinner, but I knew I wanted it to be a “breakfast for dinner” night. As I waited for my oil to be changed at Pep Boys, I went over to Pinterest and typed in “dinner” (because what else do you do as that time goes by so painstakingly slow..). 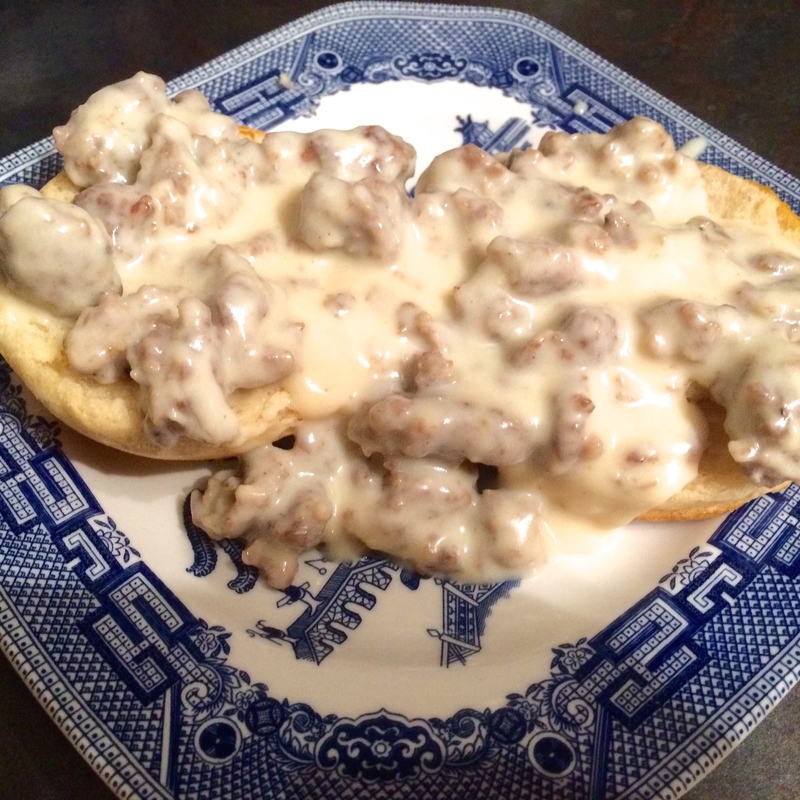 The first thing that came up was “Sausage Breakfast Gravy.” So…I present to you, my version of Sausage Breakfast Gravy as originally posted by Poofy Cheeks. She gave a great step-by-step on her website. It was a simple and cheap meal to make! We had plenty of leftovers because we are only eating for two (with the occasional bite going to our always ravenous poodle). Try the recipe out! No changes made to the recipe. Let me sweep away some of the dust that has collected since my last post. Sorry for being MIA, but we moved back to Georgia and have stayed busy! For those of you who don’t know us, most of our family is in Georgia (Dad, I said most! Not all!) I have to admit, I haven’t really cooked anything new lately, but that is all going to change. It has been difficult to cook on my work days now because I have switched to a later shift (I used to be 7a-7p, now I’m 11a-11p). On a different note, we invited friends over for dinner and game night earlier this week. It marked the first time we have made dinner for friends at our place! I made fast and easy tacos because our day started out busy (and because tacos are awesome). My favorite part of the meal– the dips! I used two dips I have recently acquired the recipe for. The dip at 2 o’clock (to the right of the salsa) is my new cheese dip. It is super easy and can be made in less than 10 minutes. Recipe: Ground beef, Velveeta Cheese, and Rotel. The dip at 10 o’clock (to the left of the salsa) is my new corn dip. It is also super easy and can be made in less than 5 minutes. Recipe: Corn, Cilantro, Green Onions, Green Chiles, Lime, Spicy Ranch. Let me know if anyone wants the step-by-step instructions!